Chi Burger discovered that Lemon Moon had received a nice review in the LA Weekly. 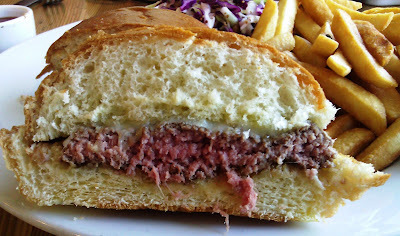 That particular review noted that Lemon Moon's Prime Burger was one of the best in LA. We wheedled Fat Bruce Lee into abandoning his family so that he could join us for lunch. Lemon Moon was a combination of the translated surnames of the chefs behind the restaurant, Josiah Citrin and Raphael Lunetta. This from the Lemon Moon website: Josiah Citrin and Raphael Lunetta, the chef team who opened JiRaffe in Santa Monica (Citrin left after a few years to open Melisse), are joining forces again. Lemon Moon Cafe, due in March, will be an upscale take-out-heavy spot geared to the West L.A. office crowd. All of this spoke to the intent of a restaurant, which was about to open. This was still on the site even though the establishment had been operating for several years. I suppose this lack of attention to detail should have raised a flag. The metered street parking was convenient, and the crowd was light when we arrived at noon. We ordered and paid at the counter and settled in to wait for about 10 minutes for our burgers.....sort of. I requested a Medium burger with American cheese. First Try: Well-Done with Cheddar. When I returned this burger, I was informed that there was no American cheese....sigh. I had to wonder if the person at the counter even listened to my order. 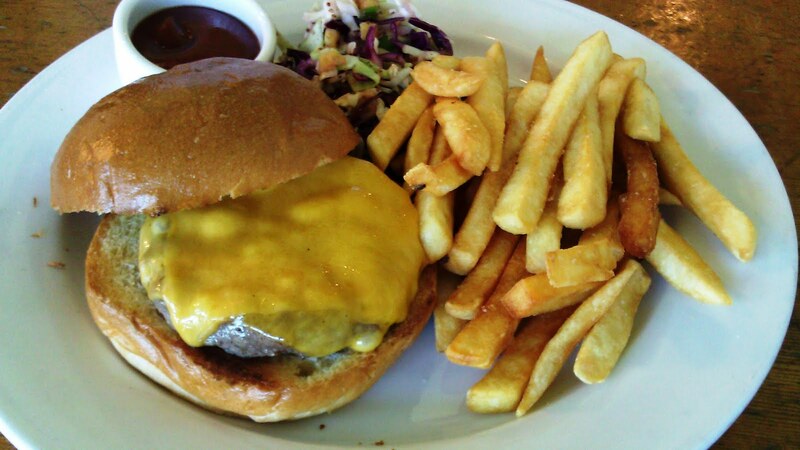 I tasted a bit of the Cheddar before I returned the burger, and it was oily and bland. I asked them to try again but with the Gruyere. Second Try: Cheddar again. I returned this burger with some exasperation. Third Try: Med-Rare (I ordered Medium), but at least it had the Gruyere...close enough, since my companions were nearly done with their meals. In retrospect, I should have given up on the first try. Some things are not worth trying too hard on. The cheeseburger at Lemon Moon was not worth the effort. The Beef: The wet-aged Chuck was a bit of a disaster. 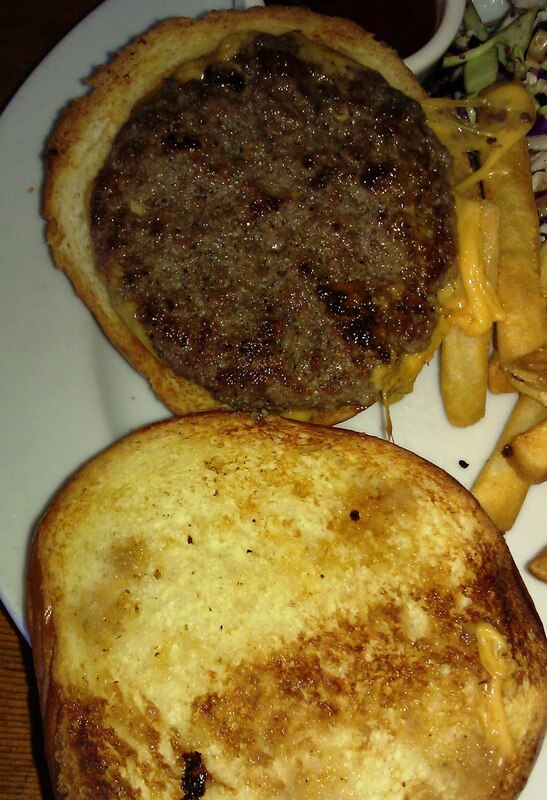 The $12 burger weighed in at about 5.5 ounces, so it was a miserly portion of beef. That was a bit of a blessing, however. The wet-aged Chuck arrived pre-ground, and it was aged to the point of passing funky and well into the territory that I defined as skanky. It was unpleasantly gamey, and that gaminess lingered on the palate long after I departed Lemon Moon. Otherwise, the burger patty was only moderately beefy in flavor, and that was it. It was not juicy in the least. The thin patty was also overly firm and chewy. The beef was simply not good. I choked down half of my burger and gave up. The Seasoning: Only the exterior of the burger patties were seasoned. The application of salt was on the heavy-handed side. I brought 1/2 of my burger back to the minions, and they all shared a similar opinion as to the amount of seasoning on the burger. The Sear: Meh. The burgers were cooked on a too-cool flat-top, and the resultant sear was weak, rubbery, and spotty. The Preparation: The burger patties at Lemon Moon were prepped in the morning. In spite of a light crowd and at least three cooks manning the kitchen, the quality of the food and preparation was poor. Chi Burger requested Med-Rare and received Med-Well. Fat Bruce Lee requested Medium and received Well Done. The Cheese: The Cheddar was oily and bland, but the Gruyere, which Lemon Moon managed to get on top of my burger on the third attempt, was very nice. It was savory and nutty. The Gruyere was the best thing about this over-priced, poorly prepared cheeseburger. The Bun: The brioche bun was sourced from Rockenwagner Bakery. This bun was two sizes too large for the wee, beef patty. The brioche had a leathery skin, and the interior, while sweet, was very spongy and on the dry side. This, when coupled with the chewy dryish beef, served to create a moisture sapping bite. Even after removing the bottom bun, the dish was still overly dry. Additionally, the bun was only nominally toasted, so it provided nothing by way of crunch, and this further reinforced the rubbery mouth feel of the beef. The Meat To Bun Ratio: The over-sized bun overwhelmed the small, thin burger patty. The Sides: The fries arrived at Lemon Moon in a frozen state. The thick-cut fries were peel-off, and they were cooked to a crisp golden brown in very hot soy oil. Chi Burger remarked that the fries were nearly identical to the ones that were found in cafeterias in grade school and middle school when he was a youngster. The fries were mealy in the center and they set up into a thick paste as we tried to chew them. Since my burger required repeated re-fires the original batch of fries were nearly at room temperature by the time the kitchen delivered the third burger. This was a weak move--they should have made fresh fries. They were nicely seasoned, though. On another positive note, the mixed vegetable slaw, which accompanied the cheeseburgers, was fresh and flavorful. This side was the best thing on the plate. The Toppings: Sigh....the shredded Iceberg lettuce was limp and lukewarm, and the tomato slices were under-ripe. The sauce for the burgers was nice. It was essentially a Thousand Island dressing, but it was a savory version with notes of tarragon and dill. Finally, the caramelized onions were tasty. The Value: The value was exceedingly poor. It was $12 for a burger, which was was lacking in every area. The burger patty was undersized. The quality of the ingredients did not warrant the price point. Additionally, in spite of numerous blundering attempts to deliver an acceptable dish, not one person checked in with us to ascertain if the final attempt was satisfactory. Lemon Moon was founded by two well-regarded chefs, but none of that culinary horsepower was evident on the day that TheBurgerBusters came to call. The burgers were over-priced and sloppily/incompetently prepared using weak ingredients and no apparent regard to customer satisfaction. As a result, this was a wholly unsatisfying dining experience. Burger Review : No! No! No! This was one of the worst burger experiences that we have had in Los Angeles. Rating...One Bite One truly unfortunate bite. Don't you ever worry about sending your burgers back that they'll do something unhygienic to it, especially when you send it back twice? HAHA...that thought has occurred to me from time to time. I count on my immune system to do its job in those instances. As a consumer, I vote with my dollars, and I despise rewarding an establishment for food, which has been prepared with blatant carelessness. As a reviewer, I try to give the establishment an opportunity to put forth their best possible effort. As a former line cook and then chef, I sympathize with the kitchen staff--it's a pain to have food come back. However, when I send food back, it's never due to a minor faux pas--I only send it back if it has been prepared so incorrectly that it would be impossible to review it fairly. Having spent my youth cooking in pizza houses and cafes, I would never send food back to the kitchen, unless I'm in a Michelin-starred place.